A suicide bomber detonated explosive in an Afghan protest rally Tuesday, killed 68 people and wounded at least 165 according to Attahullah Khogyani, spokesperson for the provincial governor. The attack raised considerable concern about the ability of the Afghanistan government and efficiency of U.S-led troops who have been stationed in Afghanistan in response to September 11, 2001, WTC attacks, which were carried out by the notorious Al-Qaida terrorist organization based in Afghanistan. The key objective of War on Terror was to identify, locate and demolish Al-Qaeda and its accomplices, deny sponsorship, support and sanctuary but the latest wave of increasing violence in Afghanistan bring both the parties to question. The Taliban denied any involvement. No other terror group claimed responsibility, but both Taliban insurgents and the Islamic State group are active in eastern Afghanistan where the incident happened. 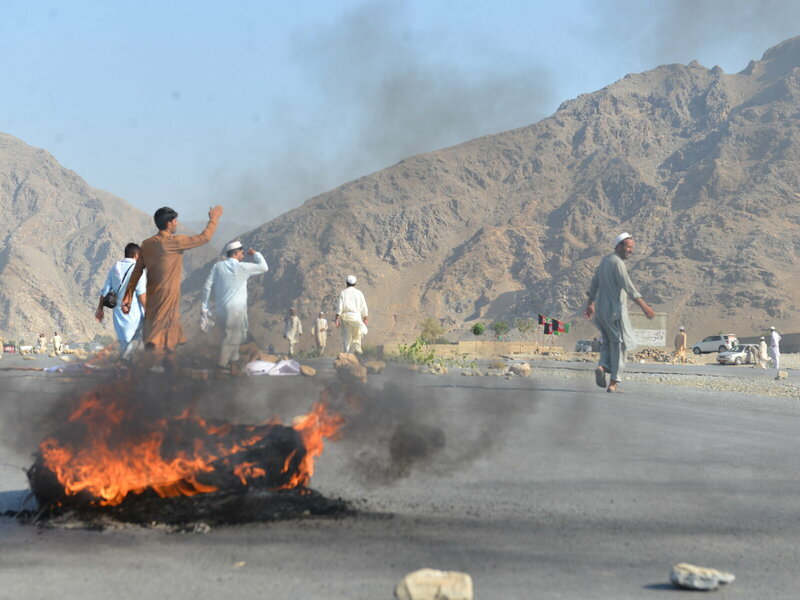 The officials said bombing happened when several hundred people gathered to protest against a local police commander by blocking the main highway between Jalalabad and the Torkham crossing on the border with Pakistan. Ahmed Ali Hazrat, head of the Nangarhar provincial council, said citizens are fed up with insecurity and attacks occur frequency where the government doesn’t pay attention. The suicide attack occurred an hour later, several small explosions took place near schools in different part of Jalalabad. On Sunday, Islamic State claimed the responsibility for a bomb attack in Kabul, where civilians were gathered to commemorate the anniversary of anti-Taliban commander Ahmed Shah Massoud. The list of terror attacks claimed by the Islamic State and Taliban is never-ending. Afghans ask why the United States, invaded Afghanistan after the 9/11 attacks, has not managed to secure Afghanistan and protect citizens, government officials. Both the Taliban and Islamic State carry out near-daily attacks in Afghanistan, targeting hundreds of civilians. Tuesday’s attack was marked as one of the highest death tolls attacks in Afghanistan this year. All the attacks either include bombs (suicide bombers) or indirect/direct fire. The U.S and coalition forces still have a strong presence in the country as compared to the Afghanistan government, who have poor presence at the local level. The foreign forces continue to hunt freed and hidden Taliban or Islamic State terrorists in the country without any precise intelligence and leads. US President Donald Trump stated that he would expand the American presence in Afghanistan after gaining knowledge about 20 terrorist organizations are active in the country. The U.S promised to use a new strategy, not only for increasing troop numbers but a distinctive methodology to demolish the terrorist networks as terrorists are great at going to ground and reappearing in other forms. BBC reported that the Taliban are openly active in 70% of the country, controlling 14 districts and the Islamic State is more active in the country than before. The only solution to terrorism in Afghanistan is through the use of an upgraded modern forensic technology that is safe, non-invasive and has unprecedented accuracy rate in providing intelligence and leads that no other existing investigative tool could offer. The technology that has the ability to crush terrorism is designed and developed by Brainwave Science and it’s called iCognative. The primary challenge for US-led troops and Afghan law enforcement is to identify the terrorists from innocents, gather accurate intelligence about terrorist hideouts, plan of attacks, location of masterminds and other vital information that cannot be gained through any conventional investigative tools. Only iCognative has the capability to provide accurate intelligence mentioned above through the best-known source- the human brain. The technology sets a new standard in security solution as it recognizes the vital difference between a terrorist and an innocent is the recognition of the specific terrorism-related information stored in their brain. iCognative offered only by Brainwave Science can accurately determine what the terrorist/s knows by recording and analyzing brainwave responses to specific information with over 99% accuracy. This technology is so fierce and powerful that it can identify active or inactive terrorists before and after any terrorist act happens. Once a 45-minutes iCognative test is subjected to every suspect, the system would reveal his/her connections to any known or unknown terrorist organization operating in Afghanistan or nearby region. Only this technology could reveal 100% accurate hidden links and connections that domestic and foreign law enforcement agencies have been trying to establish for past 17 years. iCognative technology not only helps law enforcement agencies find terrorists but also provides the key to dismantle the Taliban, Islamic State and other terrorist organizations around the globe. It is only imperative that the United States and Afghanistan Government deploy Brainwave Science’s iCognative technology to fight the terrorism to advance their national security mission.